Geneva- The Moroccan authorities' arrest and arbitrary prosecution of journalists and activists while ordering international human rights organizations be closed are deeply alarming, says the Euro-Mediterranean Human Rights Monitor. Such practices only violate the principles of democracy and human rights, especially with regards to the right to freedom of opinion and expression. 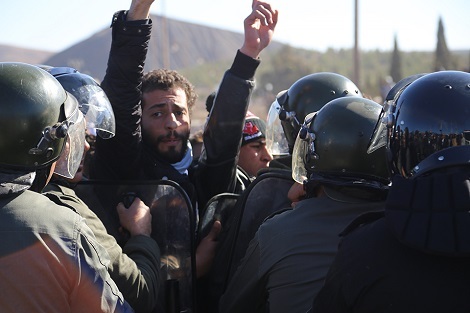 Moroccan authorities pledged it would respect such rights during the 2011–12 Moroccan protests, the non-profit watchdog further warns. Journalist and activist Hamid al-Mahdaoui, who expressly showed opposition to the Moroccan government through his writings on social media, was held on trial for a second time and was sentenced to three years in prison for failing to report a felony affecting state security. Al-Mahdaoui has already served a year in jail as of June 20 last year. He criticized the Moroccan government's ban on organizing a peaceful protest by an opposition group, and for that, he was charged with inciting to participate in an unauthorized protest. With the Moroccan activist serving his full sentence on 28 June 2018, the Casablanca Court of First Instance issued another jail sentence for three years and a fine of $300, for failing to inform the authorities of two phone calls he had received on 27 and 28 May of the year 2017. During these calls, a stranger is said to have asked al-Mahdaoui to publish news about intentions to smuggle weapons to support the opposition movement in Morocco. Relying on illegal wiretapping of al-Mahdaoui’s phone, the verdict itself is unjust. Al-Mahdaoui did not take the call seriously nor did he publish the alleged information. He also confirmed that he’s used to receiving many calls of this kind, which he never takes seriously, an act that exempts him from punishment even by the Moroccan Penal Code itself. The ulterior motive behind the new charge against al-Mahdaoui is to silence his voice as a journalist opposing the government, stressed Moussa al-Qunidi, Euro-Med’s representative. He also added that the continued restrictions on human rights and press work are a flagrant violation of the principles of freedom of opinion and expression guaranteed by the International Covenant on Civil and Political Rights, which Morocco joined in 1979. By documenting events around them, journalists and activists are not committing crimes. Rather, those preventing them from documenting are committing a crime, al-Qunaidi further added. The case of al-Mahdaoui is no exception. On 26 June, the Court of Appeal in Casablanca issued a five-year prison term and a fine of $210 against journalist Mohamed al-Asrihi. He was arrested on June 6, 2017, following his coverage of an anti-government protest by the Rif Movement, in northern Morocco as part of his work for the Rif 24 Channel. The court sentenced for several charges without citing evidence or facts. Charges included: destabilizing Morocco's internal security, participating in unauthorized protests, inciting against the unity of the kingdom and insulting government officials. In addition, the authorities arrested six other journalists while covering the same protest. They were charged with criminal offenses involving compromising state security. Other journalists were beaten while filming and covering the protest as well as security forces’ assault on activists. The Moroccan authorities are not only harassing Moroccan journalists and activists but also those of other nationalities. On 25 July 2017, the authorities forcibly deported two Spanish journalists, one who had been living in Morocco for 17 years. and refused to grant permits to international press to cover events in Morocco. International organizations such as Human Rights Watch and Amnesty International are still banned from working in the country for three years now, says Euro-Med Monitor, describing the act as ‘unjustifiable undermining’ of human rights work. The Euro-Mediterranean Human Rights Monitor calls on Moroccan authorities to stop cracking down on journalists and human rights defenders in the country, to release all detained journalists and activists, to lift restrictions on the work of local and international human rights organizations in compliance with their obligations under human rights laws and conventions.